Maradhi Manni: Humen Tumse Pyaar Kitna...Har Din Hum Aapko Yaad Karten Hain, Gungunaate Hain, Aapke Gaanen! Humen Tumse Pyaar Kitna...Har Din Hum Aapko Yaad Karten Hain, Gungunaate Hain, Aapke Gaanen! The legend called Kishore Kumar! Today is the 85th Birth Anniversary of our famous Kishore Kumar, Hindi Film playback singer, actor, director, lyricist, composer, the list goes on...a multi-faceted personality. As all my friends know, my day begins with MS Subbulakshmi's Vishnu Sahasranaama first and then the radio is switched on. From Vividh Bharati's Sangeet Sarita programme, I start hearing Kishore, Rafi, Manna Dey, Latha and Asha's songs! They seem to repeat the songs often but I never get bored. Kishore is the first favourite of all the members in my family. I have written many times, about how crazy my elder son was and is, about Kishore Kumar's songs. My mood lifts up as soon as I hear his voice! We can recognise Latha's voice the decade of the song, since she started singing from a small girl to middle age and now old age...her voice changed slowly (Latha is my favourite singer too!). But Kishore Kumar's is the same from the mid 40's to the late 80's. You can know more about him with this wiki link here. 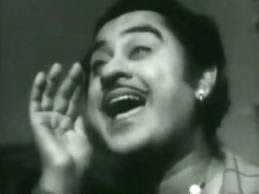 Kishore Kumar: Who can live in this stupid, friendless city where everyone seeks to exploit you every moment of the day? Can you trust anyone out here? Is anyone trustworthy? Is anyone a friend you can count on? I am determined to get out of this futile rat race and live as I've always wanted to. In my native Khandwa, the land of my forefathers. Who wants to die in this ugly city? PN: If you didn't like Bombay, why did you stay back? For fame? For money? KK: Of course I did. I was the biggest draw after Dilip Kumar. There were so many films I was doing in those days that I had to run from one set to the other, changing on the way. Imagine me. My shirts flying off, my trousers falling off, my wig coming off while I'm running from one set to the other. Very often I would mix up my lines and look angry in a romantic scene or romantic in the midst of a fierce battle. It was terrible and I hated it. It evoked nightmares of school. Directors were like schoolteachers. Do this. Do that. Don't do this. Don't do that. I dreaded it. That's why I would often escape. PN: Is that why you prefer to be a loner? KK: Look, I don't smoke, drink or socialise. I never go to parties. If that makes me a loner, fine. I am happy this way. I go to work and I come back straight home. To watch my horror movies, play with my spooks, talk to my trees, sing. In this avaricious world, every creative person is bound to be lonely. How can you deny me that right? He was acting as if he was crazy, but was very very intelligent, eccentric, you can say. Both Latha and Asha used to say in some interviews that he used to cut jokes all the time and their voice used to get 'kharaash' with all the laughing, before recording the songs. So they tried not to laugh, but Kishore would not let them stay sober! Everybody who came across him loved him. You can read more about him in the link and get alarmed or just laugh! I feel like copy-pasting the whole interview but pushed myself to stop! I regret that he died very early in his life...he was just 58. You can read about his career and other information in the wiki link I quoted in the beginning. Now, let me write about my favourite songs of Kishore! He is a good comedian, I said. Have a look here in this song. Suni Dutt also is here who was a famous hero of those days, but here, he is not 'visible' at all: He sang for Dev Anand in many movies. Both Latha and Kishore's voices are superb here. and here! He sang for Sanjay Dutt here This is my favourite song. Kishore is singing for his brother Ashok Kumar. You can see Tanuja also (Kajol's mother!). Music director is Kishore Kumar. I think he produced this movie. Here is the song. This song is from 'Amar Prem'. Rajesh Khanna's famous movie. All the songs in this movie are good. One sample is here: 'Aradhana' was a hit movie of those days. All the songs by music director, SD Burman in this movie, were famous. One is here. Kishore is singing for Amitabh here. This song is from the famous movie, 'Julie'. I love this song. Kishore is singing for Amitabh in Shiv-Hari's music, for the film, 'Silsila'. My favourite song. Again all the songs in this movie are hits. Only Kishore and Amitabh can do justice to this song, 'paan banaras wala'! Another masti song of Kishore, picturised on Randhir Kapoor and his wife Babita (Ranbir Kapoor's parents!) is here. Lovely song. This is a sad song, but a very good song. This is my most favourite song picturized on Amitabh. Kishore's voice is at its best! Such a deeeeep voice! Music is by Bappi Lahiri! Here it is! Let me conclude this post, reluctantly, with a happy song! Still so many of my favourite songs are there. I might make another post with them. He was not classically trained, but he was able to sing any type of songs. He was a gifted person. He is going to live in the hearts of all music lovers forever. P.S. : Please mention your favourites in the comment section! How did I forget to add the songs of this movie, Aandhi?! All the songs are good. It is here Another favourite song which should not have been left out! Enjoy this! I have not seen Hindi movies of that era. I don't think I have seen any Kishore Kumar's movie! I saw two of the embedded songs above (sung by him) and they were good. Need to see these movies. What a delightful tribute, Sandhya - more than that interview, for it has your own love of the signer, and his life, as the frosting! Love all of those songs too! A treat for both eyes and ears and the heart here! Oh I loved Kishore Kumar. Most of Rajesh Khanna, Amitabh and Dev's songs sung by him are my favourites. Lovely tribute! DESTINATION INFINITY: You will love Padosan. It is the remake of 'Aduththa veettup pen', Thangavelu's. All the songs are good in this movie. USHA PISHARODY: Like me, You must be familiar with all the songs. He died too early. Only Abhijeet's voice comes near Kishore's voice but he doesn't seem to sing much. Otherwise no other singer, even in reality shows, sing like him...voice, expression...he is unbeatable. "I was persuaded to act in the movies. I hated every moment of it and tried virtually every trick to get out of". But was very happy when the producers' checks were honored in his account. I stand far away from the Hindi cinema... I don’t know anything about him and only his name sounds heard before. Nice knowing something about your favorite. Will try watching these songs. SG: Thanks for the comment, SG. He was always an eccentric. His unique voice made everybody go after him. Nobody is there to replace him, even come near him even now. It is like our TMS's voice. He could change his voice according to the actor's voice. Nobody was able to do like that after him. I remember recognising the actor through his voice while hearing songs. JEEVAN: Thanks for commenting, Jeevan. He was a famous singer and 4th was his 85th birth anniversary. Our whole family loves his songs, so did a post on him. Kishoreda is one of my favourites too. Two songs of his which I like and you may wish to catch up with are "Kashti ka khamosh safar hai, Shaam bhi hai tanhai bhi" which is a duet with Sudha Malhotra and has immortal lyrics by Sahir Ludhianvi.It is from the film Girlfriend. Another number I like purely because of the profound simplicity of the lyrics by Anand Bakshi is "gaadi bual rahi hai from the film DOST. All Rajesh Khanna songs by Kishore are brilliant. I never understood if Rajesh made the songs immortal or whether Kishore made the phenomenon. Very nice piece on one of our greatest singers. PROACTIVE INDIAN: 'Chingari' is a classic! It would have been nice if you had quoted some more songs! Thank you! SOUL SEARCHER: Thanks for quoting two lovely songs. Though I have heard 'kashti ka..'song, I heard it again now and noticed the beautiful lyrics. I love all the songs from 'Anand'. I never get bored of hearing them. Rajesh Khanna and Kishore were made for each other. Both of them became famous at the same time, though Kishore was famous singing for Dev Anand. Rajesh gave a booster later. Thanks once again for commenting here! Sorry for posting comment so late. I had listened to the songs the same day you had posted it :) I am disappointed that none of the 50s songs feature in your post. They were among his best songs, in my opinion. Shararat, Raagini, New Delhi, Ladki....so many lovely songs in these movies and more. Remember Shaadi....? ZEPHYR: Ah ha...I remember songs very well than the names of films where the songs featured! I have seen New Delhi and loved the movie and songs. I must check the songs of the movies you have quoted. Will do this. I should have done that before writing this post! Give me a line of the song and I will continue... because I hear them all everyday! Thank you, Zephyr! Will check the 50's songs in the afternoon! A wonderful post on the legend!! Everyone loves Kishore Da's songs - not quite sure about the present day kids but his voice has inspired and entertained three generations!! AVADA KEDAVRA: 'Phoolon ke rang se' is a lovely song. In our house, it is not just the parents but the sons also enjoy Kishore and Rafi's songs! SAI CHARAN: I know you sing and sing well always. It must have come from your father. Old is always gold, Sai! Yes, I might do another post on this subject another day! Thank you, Sai! RENU ANAND: Welcome to my space, Renu Anand! I am very happy to see a long list of beautiful songs here! All are my favourites. I might write one more post with Kishore's songs after sometime...please visit and list some more songs!!! I never missed any of Kishore Kumar movies fro his first one...he was very original. Nice synopsis of the life and times of Kishore Kumar.The interview with PN was terrific. The songs you have posted are all super hits ! BK CHOWLA: I think so too! Thank you, Chowlaji for the comment! Good to see a fellow Kishore fan here! RAMAKRISHNAN RAMANATHAN: Thank you, Ramakrishnan! I would have been happy if you had mentioned some more songs of Kishore here! I love all his songs, and also his style of singing. He had a flair to suit his voice to the actors he sang for, but then most singers had that talent those days. I loved his voice for Rajesh Khanna, I feel they were a hit together. RAMA ANANTH: Yes, they were. Remember Araadhana? Kishore's voice made Rajesh a super hero!